I always used to enjoy making caramel apples for Halloween with my mom. Of course in those days we just bought a big bag a caramels, melted them down and covered the apples with them. But since those caramels are not allowed on SCD we need to make our own caramel. While I like the taste of caramel apples, they are not always that fun to eat. They can get messy and you always end up eating all the caramel before you finish your apple. 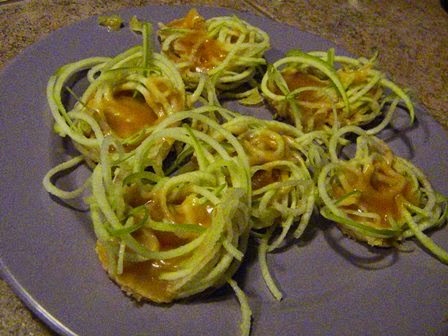 Since I recently received a veggie spiralizer I thought I would give caramel apples a bit of a twist and I came up with these nests. You could always do this as a big plate of apple spaghetti, but I like to keep things in single servings.